[Update] During the conference I added further information and links to the specific new features, etc. I am honest right now. I was a little disappointed when I attended the VMworld in the US from an announcement perspective. The whole situation changes a few months later during #VMworld EU in Barcelona. The ‘VMware announcement season was opened by the interesting (and maybe unexpected) deep partnership with Amazon’s AWS. For sure the announcement of vSphere 6.5 is the most interesting one since we were quiet disappointed with the 6.0 release and the announcement feature are removing some of the constraints we had so far in architecting our environments. vCenter Server and vSphere as a hypervisor are for many customers still the core product within VMware’s family. Those products enabled much of the agility we observe nowadays within our datacenters. At the same time no other technology has been called more often commodity than the hypervisor. To be honest: Version 6.0 was not the best release (CBT-bugs) even though many of the enhancements were really appreciated (Who does not love the vCenter Server Appliance?). With the announcement with vSphere 6.5 VMware improved a lot of the functionality within the vSphere suite. API improvements (REST API for specific vCenter actions): Click here to know more about #REST basics? The features announced with vSphere 6.5 are big-big-big. I can’t remember a VMware vSphere release that (from a paper perspective) would solve many of the problems I had within customers environments or during designing the architecture. A more detailed blog post on vSphere 6.5 only will be created soon to show and discuss the new functionalities. 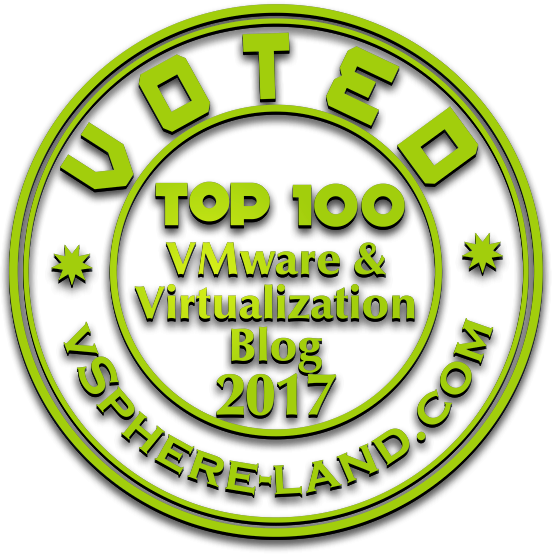 vSAN is VMware’s product to the whole software-defined storage and hyperconverged discussions and currently its fastest growing product. Introducing feature like deduplication, erasure coding and compression for the all-flash license transformed it into a valuable enterprise solution. Over the years vSAN has been improved a lot. Worked on several customer projects with vSAN I realized the performance mixed with operational simplicity (it’s all about storage profiles) is amazing (as long as everything works as expected and you work with certified hardware, firmware and drivers!!!! I have seen several vSAN implementation within the Horizon landscape (vSAN is included with Horizon Advanced). I always hoped to get additional services on top of vSAN like NFS (for User Environment Manager profiles) and design hyper-converged building blocks with vSAN. Adding iSCSI functionality is a first step to expose the new storage capabilities to other vSphere or other physical/virtual hosts (Running support Microsoft Cluster with shared disks). When it comes to log analysis and operational enhancements, Log Insight (vRLI) is a solution everyone should take a look at. Collecting Log files via syslog or the LI agent gives us possibility to act on occurring or upcoming problems in a very efficient way (especially when integrated with vROPS). With vRealize Log Insight 4.0 a new major release has been released. I really like vRealize Log Insight and especially the way it integrates with vRealize Operations Manager. It is the perfect piece to align a specific customers environment (with specific customer-unique problems) to enhance the operability and therefore the quality of the service. The real power IMO is achieved by the integration with vROPS. Finally VMware starts to harmonize the user interface of their portfolio by introducing the HTML5 based clarity UI. Seeing it in AppVolumes 3.0, SDDC-Manager, HTMl5 Webclient, etc. is finally an approach to have a slick and consistent user environment. The new alert-management within vRLI will help us all to react to problems within the environment at the earliest possible point in time. Try it out and use the free 25 OSIs of vRLI (for every vCenter license you have). vRealize Automation is VMware’s Cloud Management Platform (CMP) solution that enables organizations to deliver infrastructure-components as a service (VMs, Applications or any other software-defined server). vRA made a great enhancement from 6.X to 7.0 by simplifying the architecture. A few weeks after the 7.1 some further improvements have been announced within vRA 7.2. The big improvement within vRA is the support for Containers. VMware’s multi-cloud strategy gets to next level by including support for Microsoft’s public cloud Azure. Architectural changes like having only one appliance for vRA has not been introduced. When are going with vRA, we still need the Windows (IaaS) and the vRealize Automation Appliance. SRM gives us the chance to migrate, recover and test (full or partial) datacenter failures. I always liked the solution even though it kind of increases operational expenses. Integration with NSX and vSphere’s Storage based policy management makes it easier to deal with those additional complexities. Integrating vVols into SRM was quiet a logical step. Having the chance to create protection groups based on individual VMs instead of LUNs makes our operational processes and recovery plans much easier. SRM 6.5 now supports protection of VMs located on VVOLs using vSphere Replication. If you are using storage other than vSAN you owe it to yourself to take a look at VVOLs and see what you can get out of using them. Not sure if it’s based on my limited knowledge or caused by the typical Wednesday problem of #VMworld (people attend here know what I mean). I would love to see more of VVOLS in the future since it is quiet a cool technology and some of the limitations has been remove with the latest release.